The first book had immediately drawn me in to Claire and Jamie’s story with adventure, romance, history, and a little bit of science fiction. It ended on a cliffhanger (as all good series tend to) and I picked up the next book in eager anticipation. 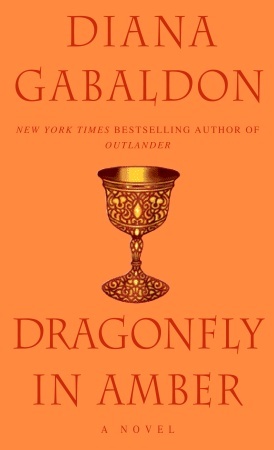 I was immediately distressed — Dragonfly in Amber begins twenty years after the end of Outlander. I will admit that I went to read the back of book three (Voyager) to ease my mind and heart. Fortunately, the beginning chapters are set in 1968 to frame the story for new readers and then proceeds to tell what happened since the end of Outlander. For twenty years Claire Randall has kept her secrets. But now she is returning with her grown daughter to Scotland’s majestic mist-shrouded hills. Here Claire plans to reveal a truth as stunning as the events that gave it birth: about the mystery of an ancient circle of standing stones …about a love that transcends the boundaries of time …and about James Fraser, an eighteenth-century Scottish warrior whose gallantry once drew a young Claire from the security of her century to the dangers of his. Now a legacy of blood and desire will test her beautiful copper-haired daughter, Brianna, as Claire’s spellbinding journey of self-discovery continues in the intrigue-ridden Paris court of Charles Stuart—in a race to thwart a doomed Highlands uprising—and in a desperate fight to save both the child and the man she loves. To be honest, Dragonfly in Amber could stand alone, which is the sign of a good book in a series. With most series, the reader is given repeated descriptions and regurgitated events, which I sometimes felt was a detraction (and insult) to series-long readers. While Diana Gabaldon did explain past events and old characters to new readers, she managed to do so in a seamless way without repeating phrases from the previous book. These are more just my thoughts and reactions to the story. All personal opinions. I don’t think I’ve cried this much while reading a book in quite a while. First of all, there was my distress at realizing the story began 20 years after the end of Outlander, and we’re back in 1968 with Claire and her full-grown daughter, Brianna. Then, as Claire begins to research what happened to the men of Lallybroch at the fateful battle of Culloden, she realizes Jamie didn’t die. When Claire stumbles upon Jamie’s gravestone while showing Brianna around the countryside I just about lost it. There were some heart-wrenching things in the middle, but the scenes near the end when Jamie sends Claire back through the stones at Craig na Dun sent me over the edge. You know a story succeeds when it elicits such strong emotions. Knowing what she does about history (future?) and the second Jacobite rising, Claire convinces Jamie to help her stop Charles Stuart. Although the book was large (nearly 1,000 pages) I wouldn’t have minded reading more about the political situation prior to the Stuart rising. I really like the double-agent aspect that Jamie and Claire adopted while they were in France. Despite hating Jack Randall in the first book, I actually really enjoyed the scenes with him and his brother, Alex in Dragonfly in Amber. I found it very interesting that even though Claire tried not to meddle with the future to save Frank’s life, it came to pass anyway, in the way it was meant to. I really like when stories play with the space-time-continuum like that (see: Back to the Future). Diana Gabaldon is a talented writer and a natural storyteller. She deftly weaves an interesting and compelling tale with exciting events and unique characters. The characters, both main and secondary, are well-rounded and have both strengths and flaws. I personally love that both Claire and Jamie make grievous errors—sometimes with dire consequences—but which they learn and evolve from. I read this one, too, some long time ago. Glad you’re still having fun! Ah, the Outlander series. You’re in for a fun ride and you have so many books ahead of you! I usually reread them every time a new one is published. This time instead of rereading them I listened to them as audiobooks and loved every second. It made household chores a pleasure. I finished the 7th book earlier in the year and I’m eagerly awaiting the 8th.